One of the east-central states of the American Union; formerly part of Virginia; made a separate state on June 19, 1863. While individual Jews went farther West as early as 1825, there seem to have been no communities before 1840 in the territory now constituting the state. On April 20, 1849, a Jewish Cemetery Association was incorporated in Wheeling by Samuel Kline, Meyer Heyman, Alexander Heyman, Julius Ballenberg, Isaac Horkheimer, Meyer Stein, Simon Stein, Seligman Oppenheimer, and Marx Graf. In the following month of the same year the Congregation Leshem Shomayim was organized, with Myer Mannheim as its rabbi. Since then nine ministers have occupied its pulpit, the present incumbent (1905) being Harry Levi, who was installed in 1897. The congregation now has 110 members, a Ladies' Hebrew Benevolent Society (founded 1875), a Relief Society (1891), and a Rabbi Wise Personal Aid Gild (1899). The Mercantile Club, Wheeling's Jewish social organization, has a membership of forty-five. Charleston, the capital of the state, contains the Congregation Bene Yeshurun, which was organized in 1873, and which is now composed of forty-four members, the present rabbi being Leon Volmer; the city likewise has a small Orthodox congregation, a benevolent society, and a social club, the Germania, founded in 1874. Parkersburg, the third largest city of the state, has a Ladies' Sewing Society, a Hebrew Aid Society, and the Progress Club, but no congregation. At different times, however, services have been held on the fall holidays. Huntington is one of the younger cities; but in 1887 the Congregation Ohev Shalom was organized with eighteen members. Its charities are now in charge of the Ladies' Hebrew Benevolent Society. 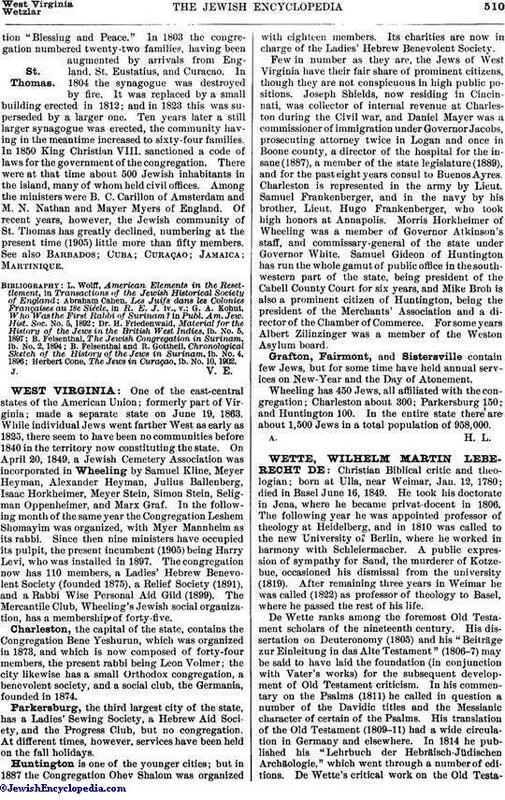 Few in number as they are, the Jews of West Virginia have their fair share of prominent citizens, though they are not conspicuous in high public positions. Joseph Shields, now residing in Cincinnati, was collector of internal revenue at Charleston during the Civil war, and Daniel Mayer was a commissioner of immigration under Governor Jacobs, prosecuting attorney twice in Logan and once in Boone county, a director of the hospital for the insane (1887), a member of the state legislature (1889), and for the past eight years consul to Buenos Ayres. Charleston is represented in the army by Lieut. Samuel Frankenberger, and in the navy by his brother, Lieut. Hugo Frankenberger, who took high honors at Annapolis. Morris Horkheimer of Wheeling was a member of Governor Atkinson's staff, and commissary-general of the state under Governor White. Samuel Gideon of Huntington has run the whole gamut of public office in the south-western part of the state, being president of the Cabell County Court for six years, and Mike Broh is also a prominent citizen of Huntington, being the president of the Merchants' Association and a director of the Chamber of Commerce. For some years Albert Zilinzinger was a member of the Weston Asylum board. Grafton, Fairmont, and Sistersville contain few Jews, but for some time have held annual services on New-Year and the Day of Atonement. Wheeling has 450 Jews, all affiliated with the congregation; Charleston about 300; Parkersburg 150; and Huntington 100. In the entire state there are about 1,500 Jews in a total population of 958,000.